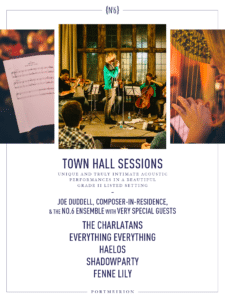 We’re proud to announce The Charlatans, Everything Everything, Haelos, Shadow Party and Fenne Lily to join composer-in-residence Joe Duddell and the No.6 Ensemble for the best Town Hall Sessions to date. The intimate Town Hall Sessions become a very special part of the No.6 programme each year, set within the beautiful Grade II listed Jacobean Town Hall which was built in 1937 and is described as one of Sir Clough’s ‘fallen buildings’, as the ceiling was cut up into 100 pieces and brought back from an auction at Emral Hall in Flintshire to Portmeirion where it was rebuilt. Past artists include James, Palace, Blossoms, Charlotte Church, Slow Readers Club and Gaz Coombes. Here’s what Joe Duddell had to say about this year’s intimate collaborations, “My residency at Festival No. 6 is always a creative highlight of the year. Festival No.6’s commitment to original programming is so refreshing; the sheer quantity of sets we’ve performed – 22 original works since the festival started – and the creativity they encourage.